Juncus effusus.Marilee Lovit.New England Wild Flower Society.gobotany.newenglandwild.org. 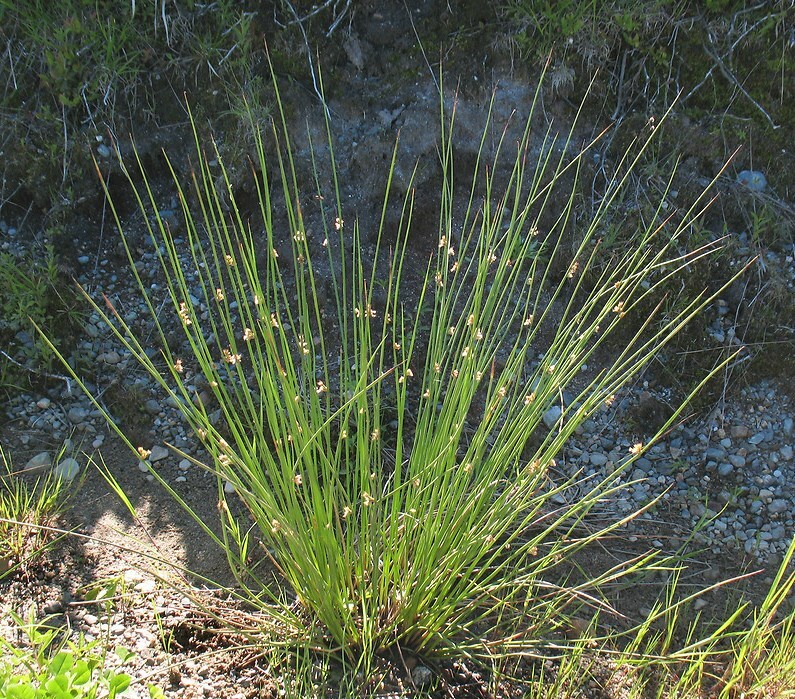 Juncus effusus is a perennial C3 rush (Kresovich et al. 1982), stems to about 70 cm long, 0.3 cm wide; densely tufted and also colonial from a thick rhizome; semi-evergreen. Leaves reduced to reddish-brown basal sheaths, to 20 cm long, stems smooth to very finely ridged, dark green, cylindrical. 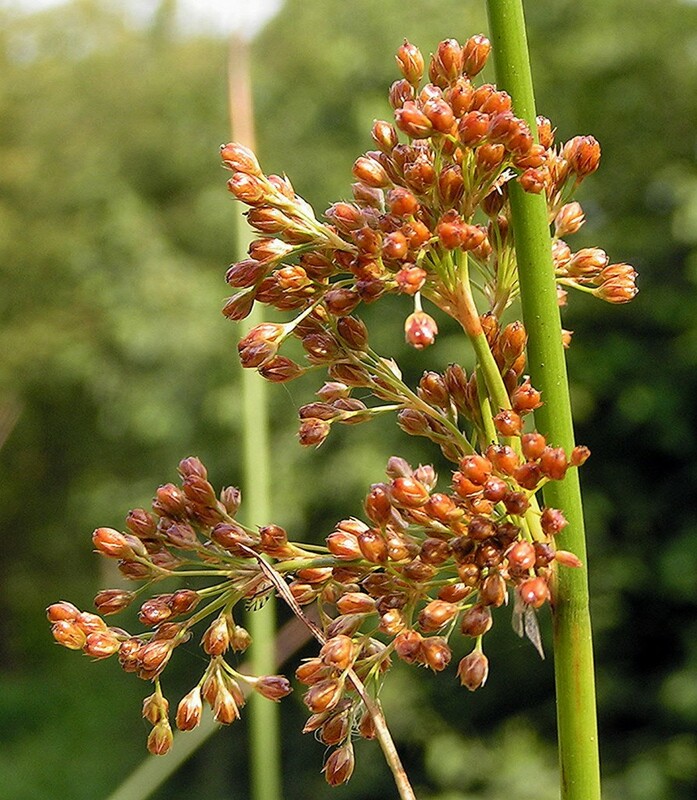 Juncus effuses.inflorescence.commons.wikimedia.org (both accessed 5/2014). Flowers 0.2-0.4 cm long, greenish-tan with whitish anthers, filaments reddish, tepals narrow, tips pointed, greenish-brown, each flower above two very small bracts; wind pollinated; inflorescence of numerous branches, umbel-like, to 10 cm, appearing lateral on stem, because bract appears to be continuation of stem above inflorescence, to 25 cm long; blooms June-July. Fruit a brown capsule, usually blunt at top, seeds 0.5 mm, July-Oct. Frequency in NYC: Common (probably more so than inventory shows). Habitat: Open wet areas, roadside ditches, wet fill, marshes, soil pH 5.5-8.8, tolerant of fire, moderately tolerant of drought, intolerant of salt and shade (USDA, NRCS 2010) but seen growing and blooming in shaded sites (personal observation). Notes: Not fussy about soil, somewhat shade tolerant, but it does not bloom well. Commonly planted in wetland restorations (Staten Island Bluebelt sites). Stems eaten by rabbits, seeds probably eaten by small birds and mammals (Martin et al. 1951). Apparently not eaten by muskrats, which may account for its success in urban wetlands.